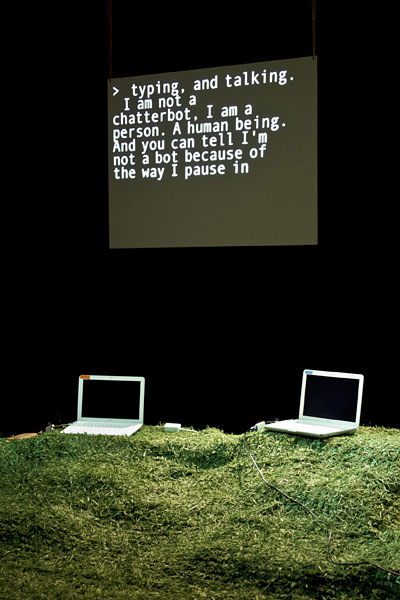 New York multimedia artist Annie Dorsen, a recipient of the prestigious Obie Award, has created a performance without people: Hello Hi There is a dialogue between two specially developed “chatbots”. 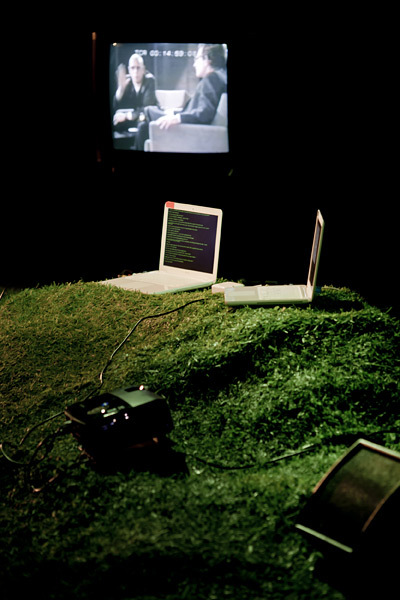 Each evening, these computer programs give a live performance of a new text, like improvisation. Dorsen was inspired by a well-known 1970s television debate between philosopher Michel Foucault and linguist and activist Noam Chomsky. As a result, we can see what happens and witness the world of ideas that is created when two computers start to talk about people. Hello Hi There had its premiere at the steirischer herbst festival in Graz, and has also been shown among other places in Oslo, Bergen, and Berlin. In January 2011, it could be seen at New York’s prestigious off-Broadway venue PS122. Works with theater, film, dance, and digital performances. She is the co-author and director of the 2008 Broadway musical Passing Strange, for which she received numerous awards and grants. Renowned director Spike Lee’s film of the performance premiered at Sundance (2009), was later shown at the Tribeca Film Festival, and was even released in American theatrical distribution. Dorsen also writes musical theater plays, and enjoyed great success with her political piece Democracy in America. She also makes short films. She is a graduate of the prestigious Yale School of Drama. In English with Czech translation.